Parallel Space is a cloning application. It allows you to clone other applications very easily. Parallel Space create as its name suggests a parallel environment on your phone in which it is possible to copy applications without affecting the original applications. 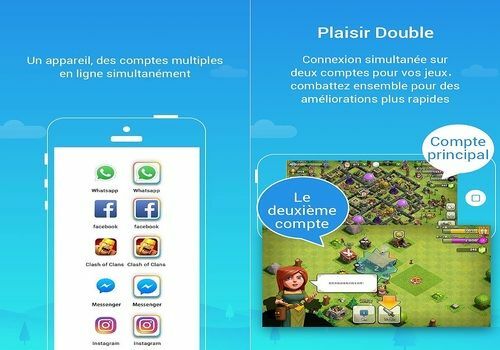 With such a tool, it is possible, for example, to have two Facebook accounts, Instagram, Whatsapp, Snapchat, Clash Of Clans, Clash Royale, Candy Crush or others on a single Android device. You can switch from one account to another in seconds without having to make time-consuming connections and disconnections. For the technical aspect, Parallel Space integrates and uses a virtualization engine. Its advantage is that it consumes only a few resources from your phone.